When it comes to eating meatless one day a week, hungry diners are out of excuses. Do yourself a favor. While trend-worshippers flock to Senate Pub on Vine Street for pumped up street grub and urban chatter, take an evening to check out the View in East Walnut Hills. Stephens Restaurant Group has seized control of the Edgecliff Room -- formerly owned by Martin and Marilyn Wade of Local 127 -- and have revamped both the name and the menu. You may be dining next to a slightly more mature crowd (it’s located in the towering Edgecliff condos on Victory Parkway), but who cares when the restaurant’s backdrop is a sprawling panoramic of the Ohio River Valley? Instead of elbowing for a bar stool, you can easily score a table here overlooking a stretched out horizon dotted with twinkling city lights. The View's mac and cheese - before/after - photography by Courtney Tsitouris. 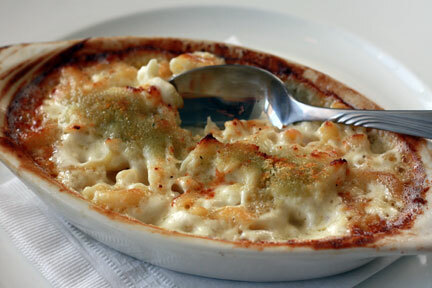 And fancy hotdogs and duck fat fries got nothin' on the fever-inducing, down home goodness of the View’s mac and cheese. It's an angry, bubbling mess of elbow macaroni, butter and cream topped with a hit of herbed breadcrumbs. It comes in a piping hot casserole dish with brown baked sides that will singe the tips of your fingers. As you break its surface with a spoon, two types of cheddar cheese hiss and scream and a wave of steam forms curlicues in the air. But watch out kids, this one is for the pesce-vegetarians. Beneath the velvety blanket of cream and pasta, lump crabmeat marries an exotic twirl of truffle essence. If your mother and a young whippersnapper chef got together, this is the homespun decadence they’d come up with. It’s Sunday supper on crack -- soul food with the complicated, evocative bend of revved-up ingredients. For just ten dollars, even red-blooded meat lovers will be hard pressed to find this much comfort and flavor packed on a plate. It’s the “classic with a twist” style that Alfio Gulisano -- the same chef behind Bella Luna -- hopes to implement throughout the rest of his menu. The View may not be a fully baked concept yet (other dishes like the grilled cheese with onions fell short of such transcendent musings), but he’s making his point. In a time of glorified bar food and kicked-up bistro classics, Gulisano shows Cincinnati that he’s coming out with guns blazing. 'Meatless Mondays' is an ongoing series on UrbanCincy that explores one of the recommendations of Cincinnati's Climate Protection Action Plan (aka Green Cincinnati Plan) - try to go meatless one day a week. UrbanCincy's 'Meatless Mondays' series is written and photographed by Courtney Tsitouris who is a cook, designer and author of www.epi-ventures.com, a blog about dining in and dining out in Cincinnati. I just went to Senate Pub! It was awesome! But I guess I'm a "trend worshipper" now? Dag. After I felt good about the entire experience of hanging out downtown. I think Courtney was just saying that Senate is the place to be nowadays. Knowing her, I really don't think she meant it as an insult. Glad you liked Senate, I've enjoyed it as well. Not meatless, but I went to this knock out good gourmet hot dog vendor in Denver last week - Alaskan Reindeer, Wild Boar and Elk hotdogs were all consumed and thoroughly enjoyed. Of course the gourmet approach to hotdogs reminded me of Senate the entire time. Not meant as an insult of course, but the Senate is trendy right now. There's no arguing that. 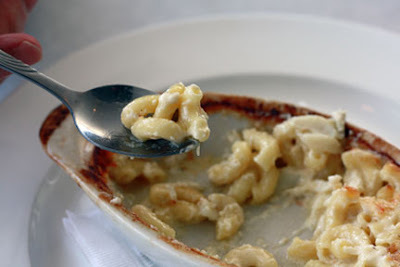 I've been meaning to try the Mac & Cheese Monday at Keystone in Covington too.